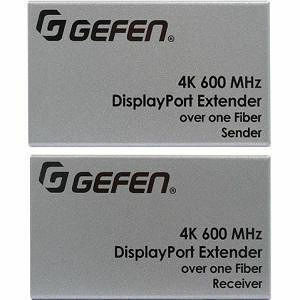 Gefen's DisplayPort 1.2-compliant extender is a compact and high performance solution for extending HDCP 2.2, HDCP 1.4, and DPCP compliant DisplayPort 600 MHz 4K audio/video over fiber. WQUXGA (3840 x 2400), 4K Ultra HD (3840 x 2160), and 4K Cinema - DCI (4096 x 2160), up to 60 Hz frame rate and 4:4:4 Chroma sub-sampling are supported. The AV signal can be extended up to 200m (660ft), over a single strand of SC-terminated 50/125 µm OM3 or better multi-mode fiber-optic cable. There is full electrical isolation between the Sender and the Receiver, meeting the stringent safety and EMC requirements for critical applications. When used with the Gefen EXT-PS52AU-M-1.3-6-AL power supply (available separately), this extender is compliant with medical safety and EMC standards EN 60601-1 and EN 60601-1-2. The EXT-DP-4K600-1SC can be powered from sources and displays featuring powered USB ports, or by using external power supplies. For most applications, the Sender and Receiver are plug-and-play and will work without any set-up. In cases where signal optimization becomes necessary due to special requirements of a source and/or a display, both units feature easy-to-use EQ switches. The EXT-DP-4K600-1SC supports popular and useful DisplayPort technologies such as Multi-streaming (connecting multiple daisy-chained displays to one DisplayPort output) and Auxiliary Channel (transporting data and controls along with the AV signal). Compact enclosures are easy to install and can be hidden away. Their sturdy metal enclosures help provide further immunity against Electro-Magnetic Interference (EMI) and radiated noise (RFI). Applications include medical imaging, military and industrial command and control rooms, flight simulators, digital signage, gaming, and wherever 4K full-bandwidth uncompressed video or end-to-end electrical isolation are essential.